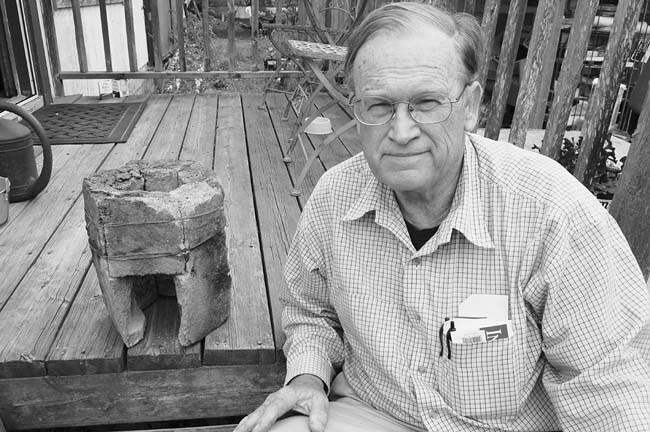 On the front porch of the house he built in West Eugene, Ken Goyer shows an example of the SixBricks Rocket Stove he developed at Aprovecho, in collaboration with rocket stove pioneer Larry Winiarski. Rocket stoves produce more heat from less fuel with less pollution than the three-stone open fires commonly used for cooking in the Third World. A native of Burbank, Goyer has worked at car repair (Ken's Ten-Buck Tune-Ups) and carpentry since he arrived in Eugene in 1979. He first saw open cooking fires when he went to El Salvador ten years ago to help Sylvia Gregory with her women's empowerment project. "I made a few stoves," he says. "They were a great hit." Over the past two years, with funding from the Rotary Club, Goyer has traveled to Africa to oversee the construction of brickmaking facilities for refugee camps surrounding Lira in Uganda and Gulu in Darfur. "We've made 30,000 stoves at Lira," he reports. "We have nine employees at Gulu." For an photo-essay showing how the stoves are built and used, visit Goyer's website, aiduganda.org.